This graph tabulates all of my cash and equity holdings minus any debts. Note that there are bumps in the graphs due to market volatility, sudden income surges from tax returns or bonuses, or unexpected large expenses. In the beginning years, the jumps will likely be due to my monthly contributions and non-periodic spikes in income. As the portfolio matures, monthly contributions will be minuscule compared to the portfolio's total size and monthly dividend checks, so market fluctuations will become more dominant in the later years. 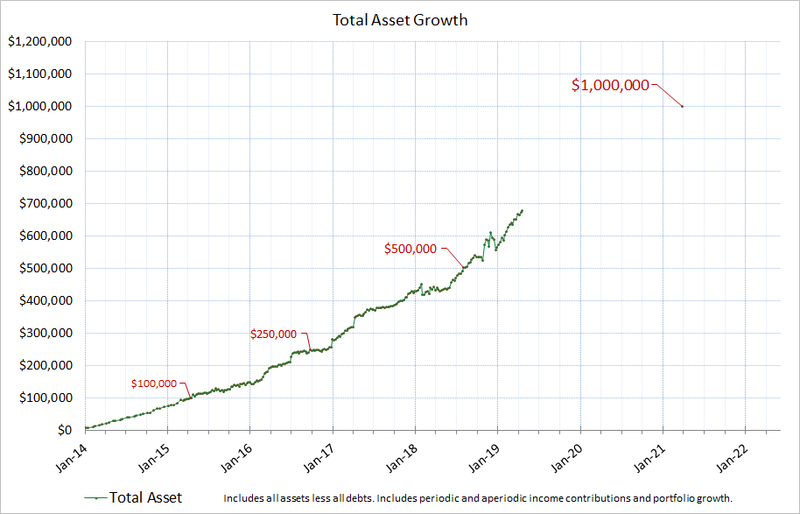 My goal is to hit $1,000,000 USD in net worth sometime after 2020 with a annual passive income of around $25,000 - $30,000. The data below does not include depreciating assets that I own such as cars, clothing, or furniture. I don't own a house so the graph below is basically made up of equities. The data below is nearly all cash or highly liquid stocks that I can sell in less than a day. Around 1% of the assets below are items that are less liquid that require 2 to 4 weeks to liquidate (i.e. solid gold). The graph below shows the forward annual dividend that I will be able to receive. 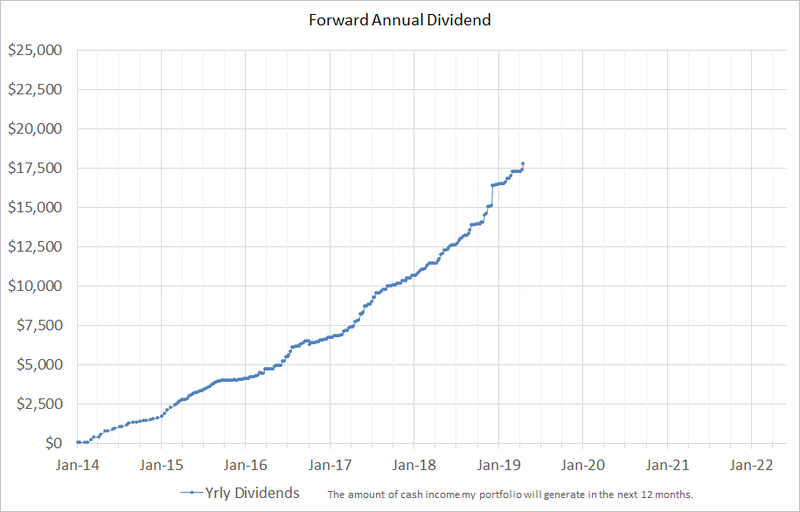 Notice how my portfolio value can jump up and down sporadically but the dividend payout graph is extremely consistent. High quality companies don't just cancel dividends out of the blue. Dividends are a certainty as long as the company's fundamentals are intact. Share price on the contrary is a large uncertainty. Share prices are up to the market and the whims of what people want to pay up for that day. The likely only reason why my forward annual dividend would go down is if a company had spin offs, or was merged into a larger company, or I re-balanced my portfolio into lower yielding companies.